I have a lot going on right now – not just my normal “lot” – but there are some big events coming up in the next few months that I am spending time on, which is taking time away from the kitchen. I will get back there eventually, but for now I need to make sure all my ducks are in a row. They are getting there, but it is taking a lot of my time. What little time I have left when I am not working – which is not a lot these days – work is 200% consuming, and then I have to think about those ducks. Those ducks don’t always want to stay in their rows. So right now I am focused on cooking healthy foods that are easy to make. Ok – I know, last week’s post was certainly the opposite of that, but I made an exception. We have been in a rut recently – a rice rut. As a family, we probably consume rice 5 out of 7 nights a week. Fortunately we switched to brown rice a while ago – but still. It is shocking to me that the kids haven’t protested yet. I decided that it just couldn’t go on anymore, and that I needed to shake things up a bit – and that’s when I thought about quinoa. Mix all the ingredients together – and serve chilled. Yes, it is that easy! 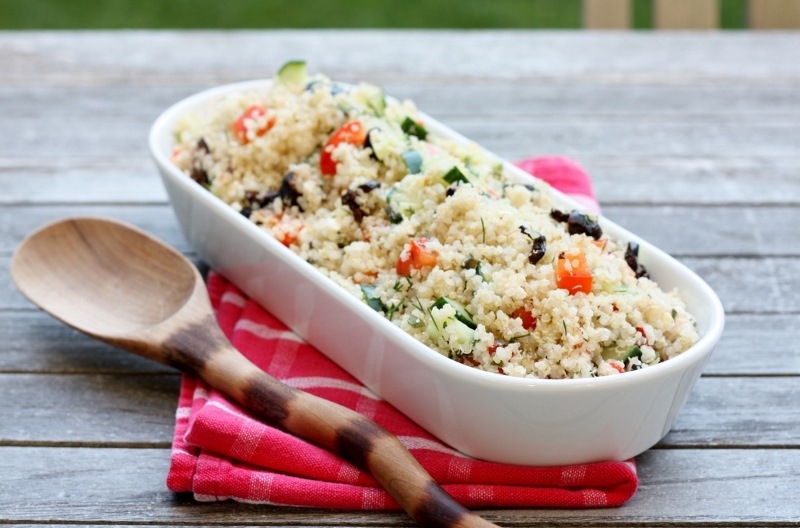 I love the idea of Mediterranean twist on this quinoa salad…so tasty! Delicious light and simple dish and I bet the feta and the fresh herbs take this dish over the top.